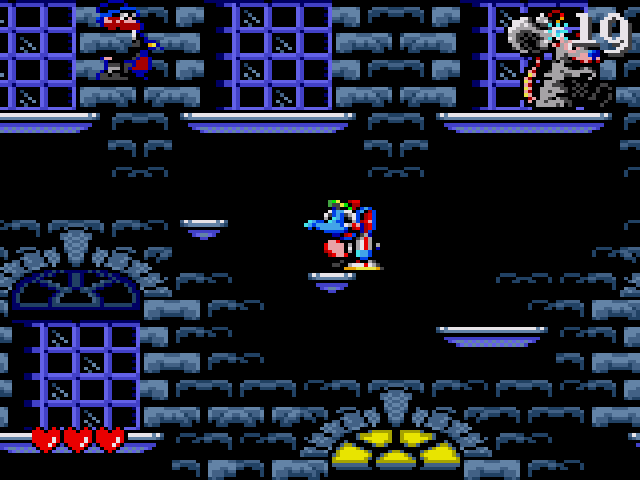 CJ Elephant Fugitive is a platform game that's exclusive to the Sega Game Gear. Imprisoned and accused of a crime you didn't commit, it's your job to escape the zoo and make it back home to Africa. Your journey takes you through five locations (London, Paris, Alps, Cairo and Africa) with three levels each, and CJ can attack by shooting peanuts or launching a limited supply of bouncing bombs. Your umbrella can also be used to float safely across perilous gaps. The level design is compact, yet leaves just enough room for exploration; I really enjoyed this non-linear approach, as even though there's many times where you're not sure where to go, you're never far away from figuring out a solution. I also appreciate how the style and environmental hazards in each world are wildly different to keep you engaged (e.g. Paris has lots of moving platforms, while the Alps is full of mazes where you need to hunt for the exit). Control wise, there's a few glaring issues, namely the fact that the jump and fire buttons are reversed which causes no end of frustration when you press the wrong button in the heat of battle. There's also a severe delay as CJ winds up his peanut projectile before firing; it certainly looks neat from an animation standpoint, but from a gameplay perspective you'll take many unfair hits. What's most annoying though is that due to the delay you can only shoot in mid-air by pressing fire, then jump! It's the complete reverse of what you'd normally expect and it's puzzling why it wasn't fixed prior to release. 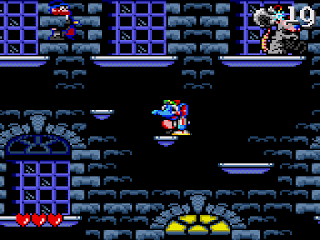 On top of this, the collision detection is spotty (occasionally leaving you falling straight through a platform), and there's too much trial-and-error due to various blind jumps. CJ Elephant Fugitive is a playable, yet unremarkable platformer that does little to innovate or excite. While the basic premise and graphical style is excellent, the action is too unpolished for a game that demands complete accuracy, and ultimately the various programming 'quirks' result in a rather tiresome experience. Random trivia: The game is a remake of 1991's CJ's Elephant Antics which was released on the Amiga, Atari ST, Commodore 64, NES and ZX Spectrum.